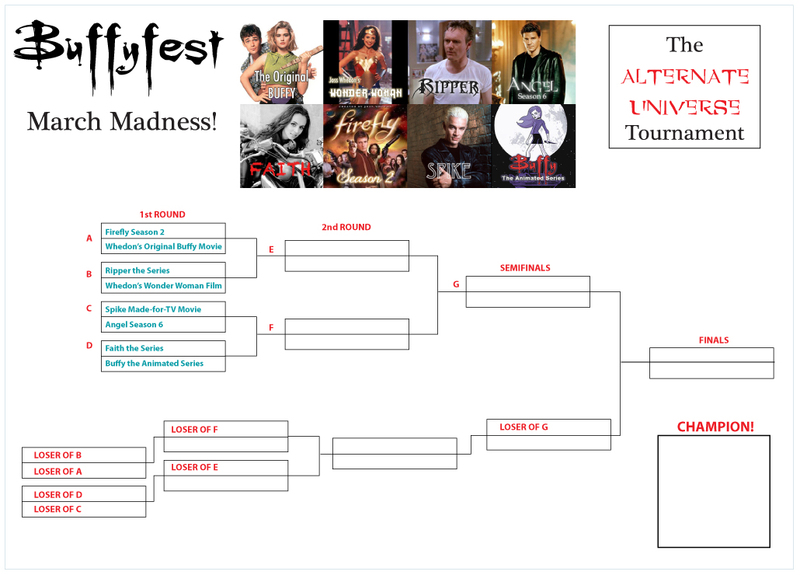 Buffyfest: March Madness - The Whedonverse Alternate Universe Tournament! March Madness - The Whedonverse Alternate Universe Tournament! IT'S THAT TIME OF YEAR AGAIN! Ahh March...Spring is about to poke it's flowery head up from the ground like a newly sired vampire's arm, Basketball fans are all up in arms about something I don't quite understand and on Buffyfest it's all about forcing certain Whedonverse things to battle against one another to the death! That's right, it's March Madness! 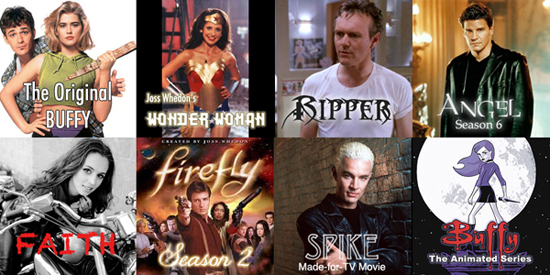 We've done a lot of these tournaments now, so it's getting kind of hard for us to think up new topics, but there's one thing that us Whedonites know about all too well and that's "What could have been?" We've had our hearts smashed from so many broken promises. Burning questions like: What if Firefly had been renewed? What if Joss Whedon had been able to make the original Buffy movie the way he wanted to? 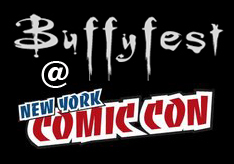 And the question that ultimately enters any Whedon conversation: What about Spike? 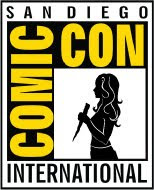 So this March Madness is going to be all about the magical Alternate Universe where those cancelled, ruined or never-realized-projects will get the chance to shine. Which one would you want to see most? This one might be a little tricky to wrap your head around since it's all make-believe unicorns and leprechauns. It's not as easy as say, who has the most World Ending Hair (Teeny bangs anyone? 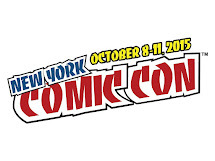 )...but I think it'll be interesting to see which unrealized project wins this thing. I can't even decide a favorite right now! It's anyone's game. Oh and please don't ask why Spike is pitted against Angel again...it's totally randomized and for some reason these Tourneys like to eff with me. 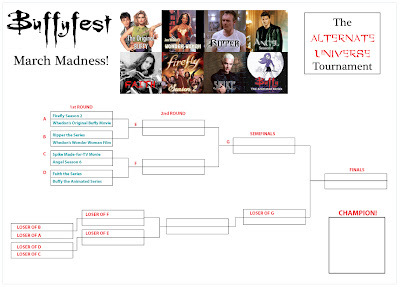 It's going to be short as we're already down to the Elite Eight, but to complicate things a bit we're going to go with what's called a "Double Elimination" bracket for the first time in Buffyfest Tournament history. Why you ask? Mostly to make my life difficult, but also our resident advisor The Maestro said it will be a more accurate final battle and if your favorite gets eliminated early on, they'll get a second chance. Ok then! This first round will have 4 matches and will end on Monday night at 11:59 pm EST. The animated over Faith? You guys are cruel. The Special Hell - for child molesters and people who talk at the theater, and make us choose between Ripper and Joss' Wonder Woman! They were all pretty easy for me except the last one; Faith vs. Animated Series. I'm voting for Firefly Season 2 to go all the way! I actually had the same situation as you, Kaaren. They all were kind of easy except the last one. That was surprisingly strange. I would love to see the Buffy Animated because it's a brilliant idea and cute and oh to see Dawn filled in the early years...but Faith would be more actual story. You know, the meaty drama of the story.